Here’s the first astrophoto I’ve published since the spring. This is a spiral galaxy called NGC 7331 and its located approximately 40 million light-years away from Earth. 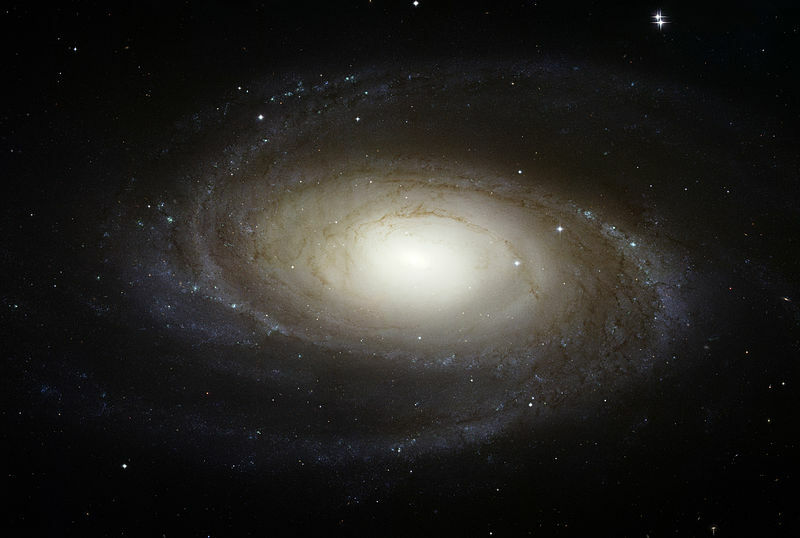 This galaxy is similar in size and structure to our own galaxy and is sometimes called the Milky Way’s twin. 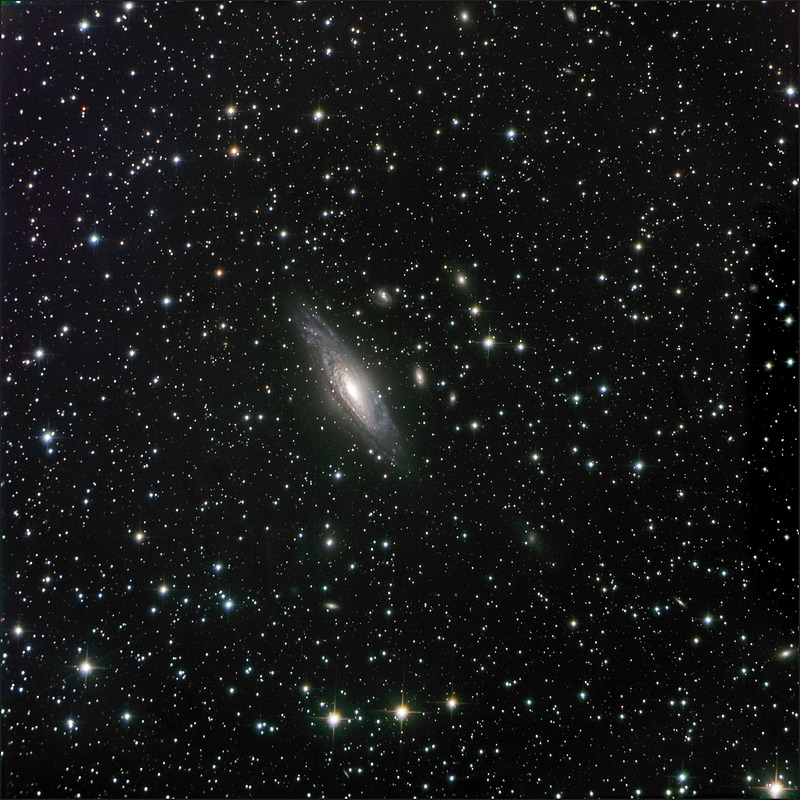 The fuzzy dots surrounding the picture are also galaxies, there are three prominent ones that appear to be hovering above the main galaxy in this photo. In reality they are just much farther away and that’s why they appear smaller. There are several other galaxies scattered around the picture. These are just a few of the 200 or so billion galaxies in our Universe, each containing about 100 billion stars. 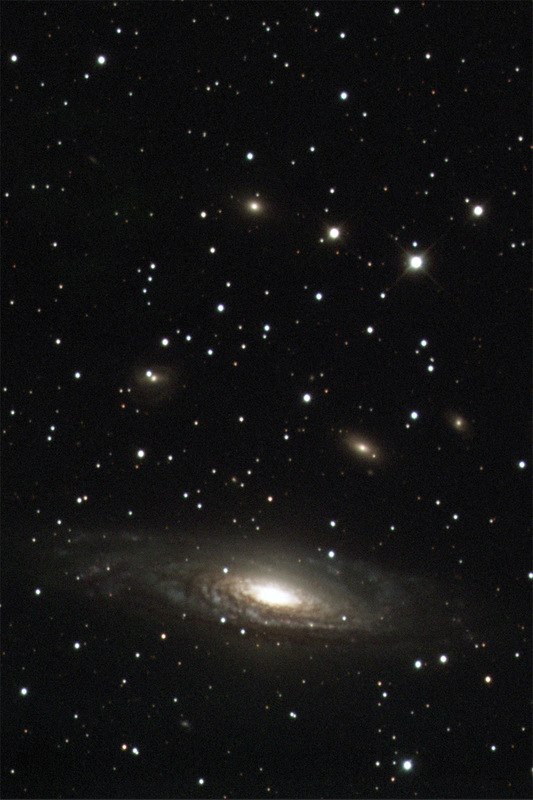 The image above was cropped in order to show the galaxy in higher resolution. 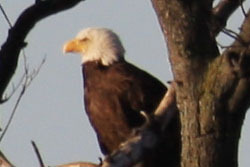 The full un-cropped image is below. Total exposure: 3 + 3 + 3 + 6 = 15 hours! Was yesterday one of those days when you felt a disturbance in the Force, as if millions of voices cried out in terror and were suddenly silenced? Well it wasn’t just a feeling. As it turns out, a super nova was detected in the Cigar Galaxy yesterday. Super Novas are the largest explosions in the Universe and this one could be seen from over 11.5 million light years away! Don’t worry about all those souls that were vaporized in this cosmic eruption. It happened a long time ago in a galaxy far far away. 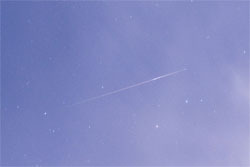 You can see the super nova in this image from this morning. Its the bright star near the bottom center of the galaxy just below the red gas outbursts. 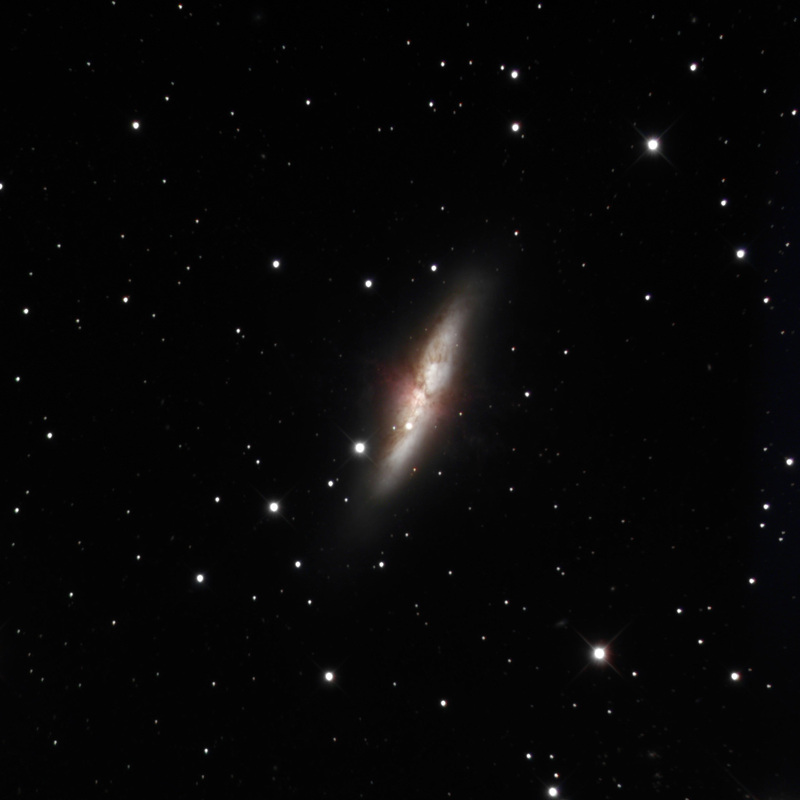 For reference, check out this image of M82 I took last spring. Clearly, that star was not there then. From what I have read, the Nova is expected to brighten over the next two weeks. 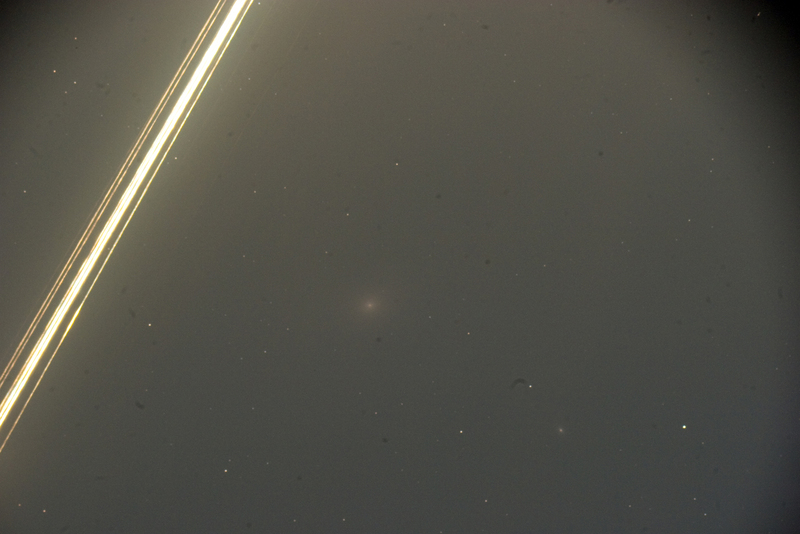 Here’s a single frame of the galaxy taken through a clear filter for future reference. This was a relatively quick exposure of just 40 minutes X red, green and blue and 60 minutes of Luminance. 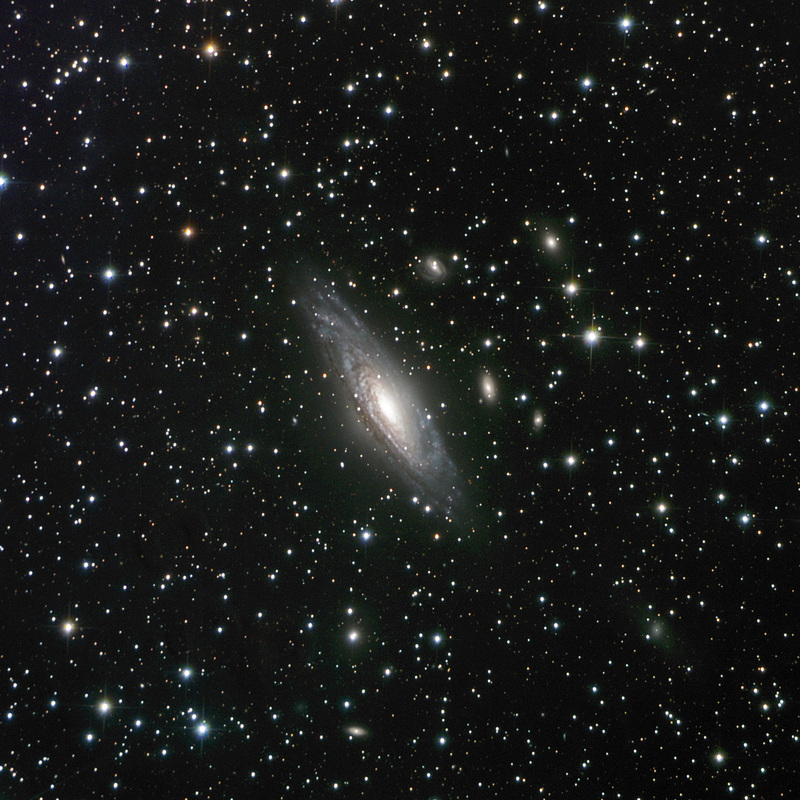 I blended in a few hours of luminance data from last year to help sharpen the details in the galaxy. Here’s my latest long exposure photo of the Triangulum Galaxy. 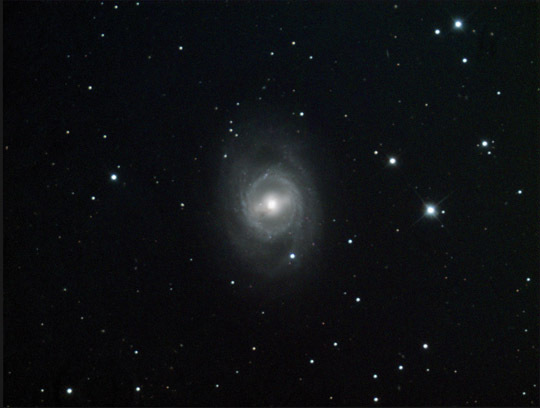 The last time I imaged this galaxy was in 2010 and I’ve made some progress since then. 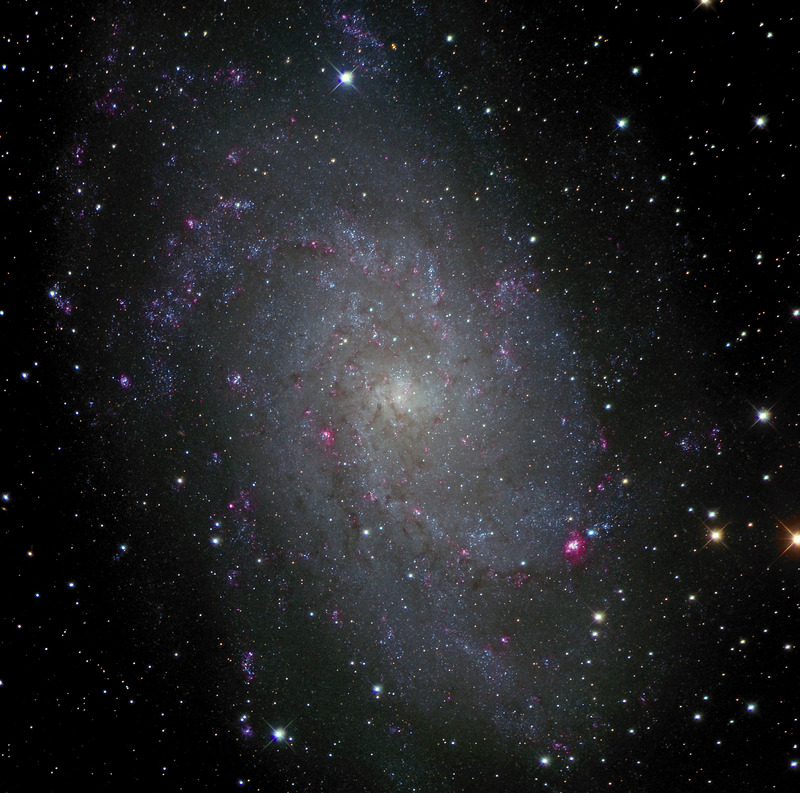 For reference, here are some of my first amateur photos of the Triangulum Galaxy. At about 3 million light years away, the Triangulum Galaxy is home to approximately 40 billion stars. 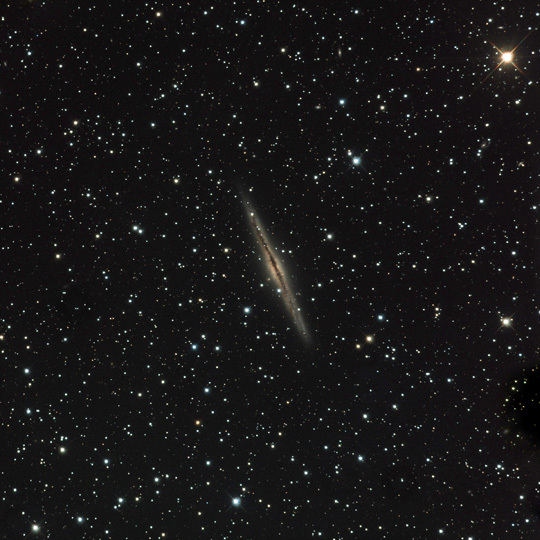 Its the 3rd largest galaxy in our local group and you can actually see it with the naked eye under very dark skies. Its apparent size in our sky is actually bigger than the full moon, but because it is so dim, you can’t really see it. Click the image below for a larger (2000×2000) version of this picture or click here for an even bigger wall paper sized version of the galaxy (4000×4000). Here’s my latest astrophoto of the spiral galaxy Messier 74. At approximately 32 million light-years away from Earth, this Grand Design Spiral Galaxy is home to an estimated 100 billion stars. I haven’t been getting as much scope time in as I’d like so far this year, but I’m hoping to buck this trend soon. While I’m still struggling with a few technical details, I had a good session last night and was able to capture some useable data for this photo of The Whirlpool Galaxy. I haven’t had much time for astrophotography lately, especially with all of the fireballs falling, but I did finally get around to processing and finalizing this picture of Messier 82, A Galaxy in Peril. I slowly acquired data for this image over the month of February and for various quality reasons had to disgard about 2/3s of it. The processed image below is the result of 9 total hours worth of exposure time gathered over a two week period. While it looks like this galaxy is exploding or being torn apart, astronomers believe the red filaments extendending outward from its core are ionized gases being blown out of the galaxy by solar winds and super nova explosions. 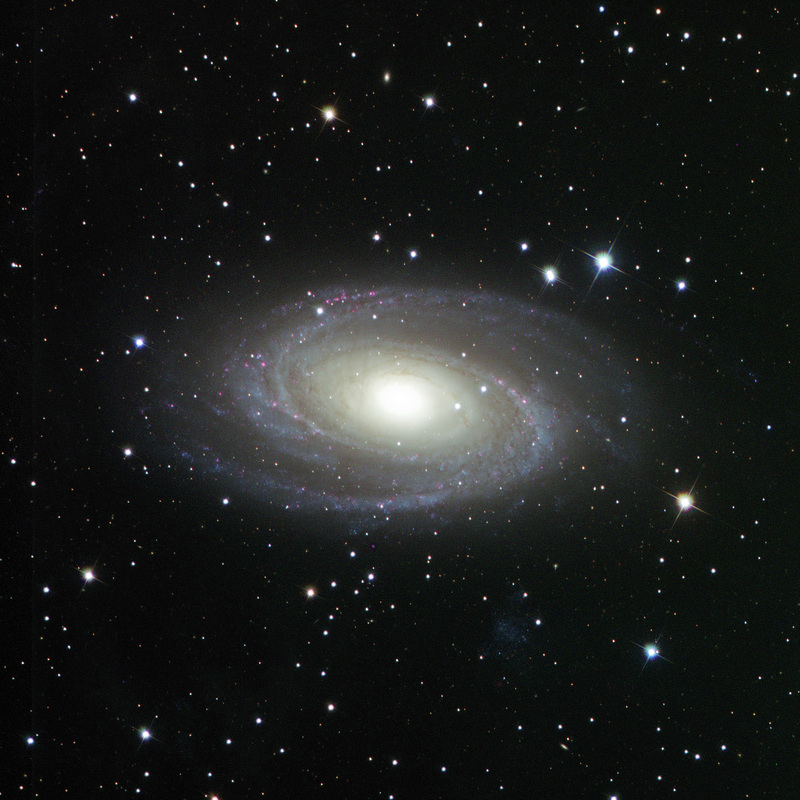 M82 is close enough to M81, that I was able to join the images into a nice mosaic of both galaxies. Here’s my first galaxy photo of the new year, Messier 81, aka Bode’s Galaxy. 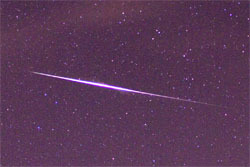 For reference purposes, here’s a Hubble photo of the same object. 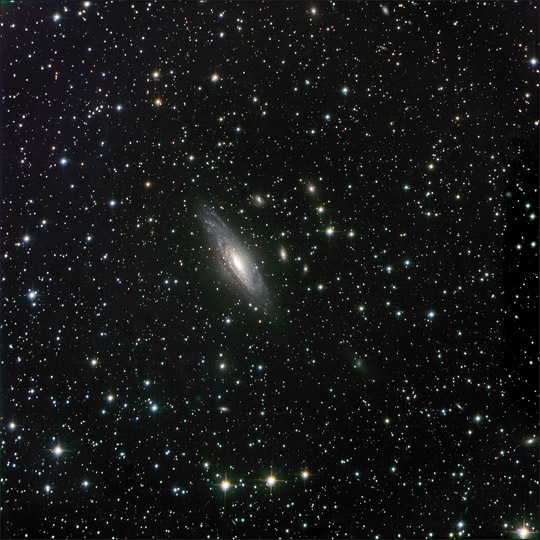 Here’s a an extra big high-res 3200×3200 version of this galaxy picture. As expected I hit a few obstacles after leaving my scope in California at the Sierra Remote Observatory. The first was a crashing PC that somehow started acting up right after I left. I ended up replacing this and re-installing all the software. I’m glad I did though, because it hasn’t crashed since (knock knock). Once the computer was stable I worked with the guys at SRO to fix the collimation on the scope. They did a great job with this and I was able to get my first run of images this week. I was tweaking tracking paramaters and setup over a few nights and still have some kinks left to work out, but we are almost there. Here’s my first light image from SRO. Its no APOD, but not to shabby. 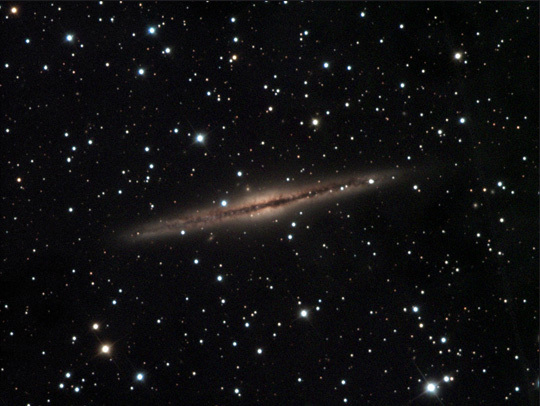 NGC 891 is considered an ‘edge-on’ spiral galaxy, which means from our perspective we can only see the side of it. 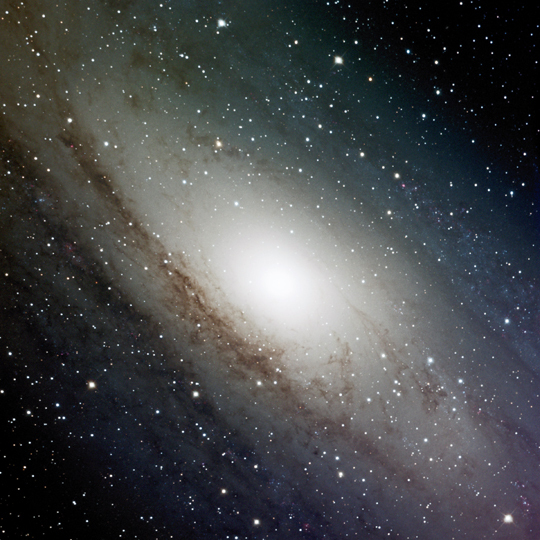 The galactic bulge in the center of the disk is a classic sign of an edge on galaxy. 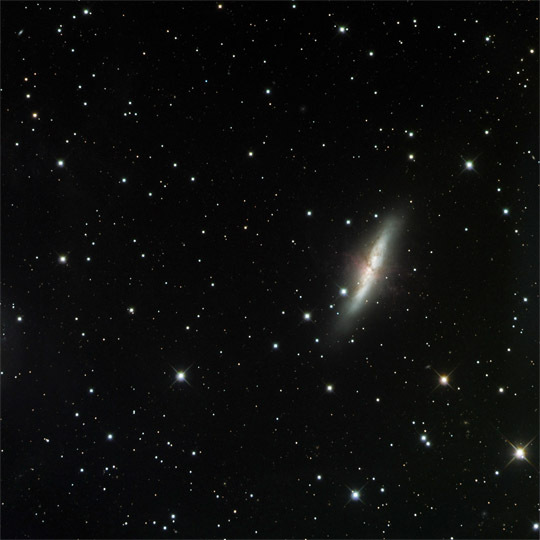 At 30 million light years away, NGC 891 is one of the most famous edge-on spiral galaxies. Its also one of my favorite astrophotography targets. 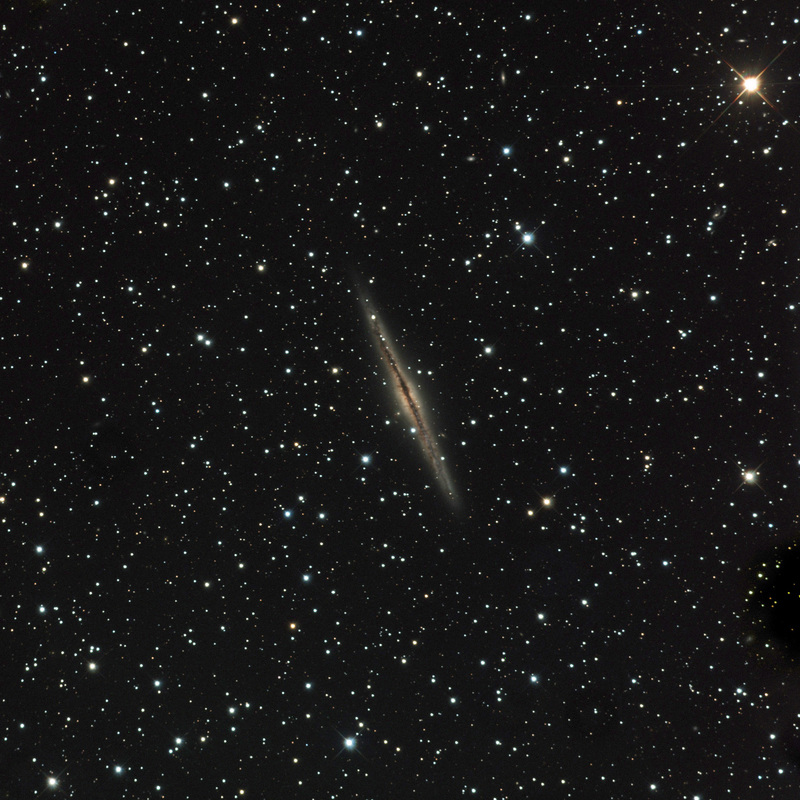 Here are some of my past images of NGC 891 – NGC 891 – December 3rd, 2011 and another shot of NGC 891 on February 7th, 2011. The Andromeda Galaxy has been one of my favorite pursuits since I started with astrophotography. 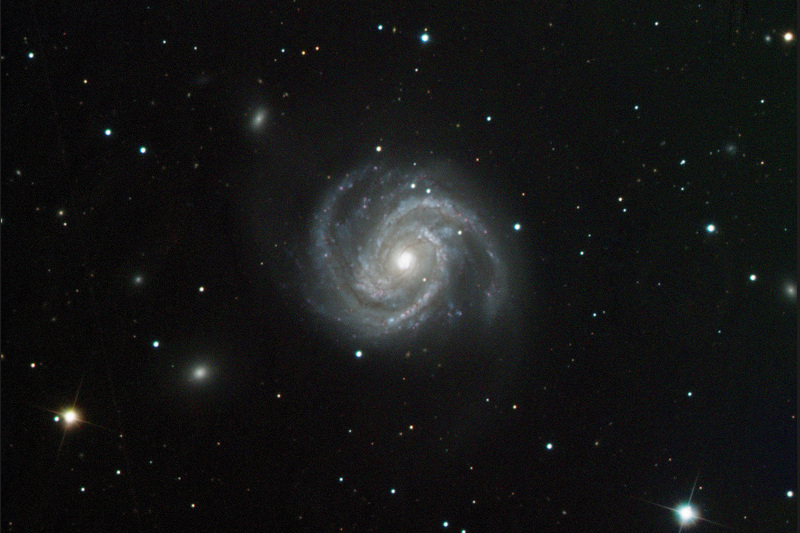 It took me a while to figure out how to shoot it and each telescope you use reveals different things about the galaxy. 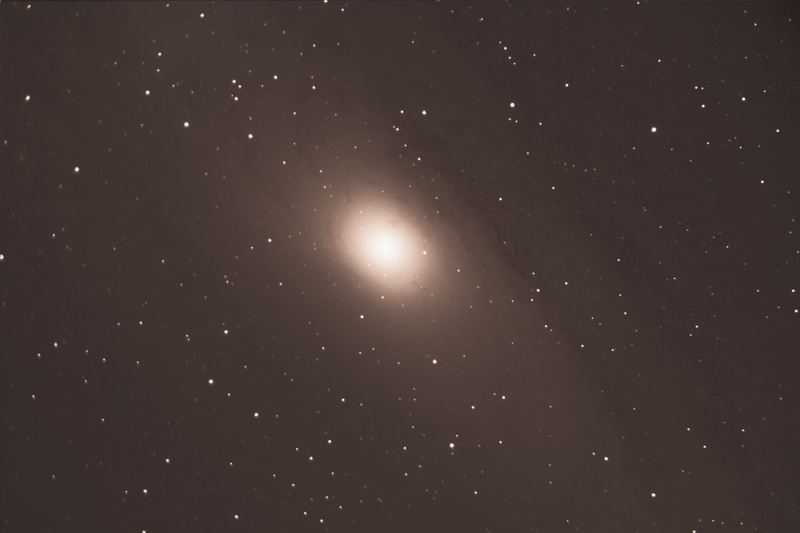 I took this photo of Andromeda Friday night using a 14.5 inch RC and full format CCD. 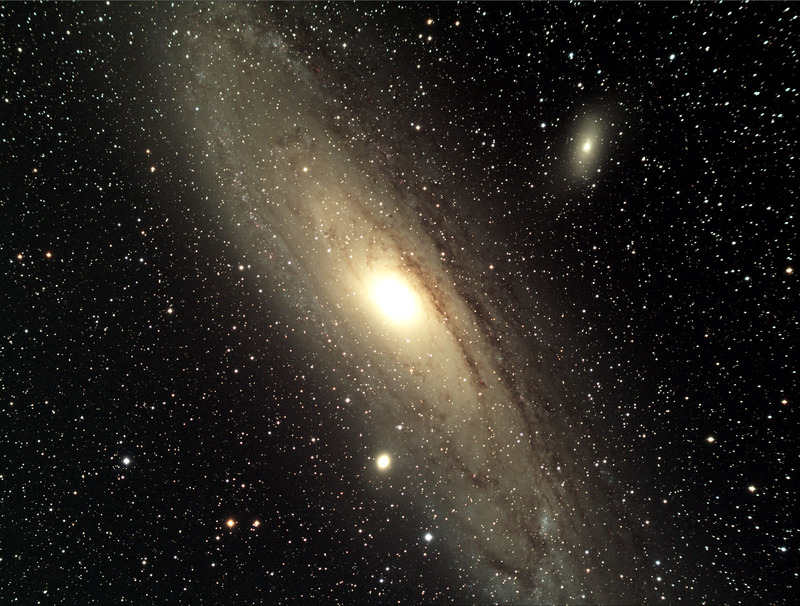 Andromeda is still too big to fit completely in this field of view, but I think we are getting about 75% of it. For reference, this is the same setup I used on the blue moon, so yes, Andromeda is bigger than the full moon in the night sky. Its just dimmer and harder to see with the naked eye. Imagine what it would be like to look up in the sky and see something like this. Click the picture above for a [2400×2400] version or download a super high res [3700×3700] version of Andromeda here. 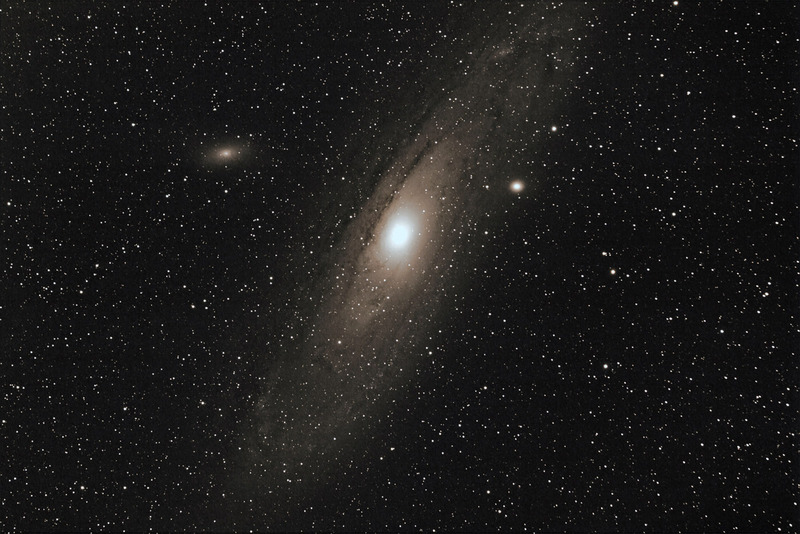 For comparison purposes, here are some past photos I’ve taken of Andromeda: Andromeda with a FLT 98 wide field telescope and SBIG ST8300 CCD in September 2011, Andromeda with FLT 98 and DSLR Camera in September 2010, the first picture I ever took of Andromeda with a Celestron CPC1100 and DSLR in January 2010 and of course the telescopic Bolide with Andromeda picture from July 2009.
here’s a zoomify version that is fun to play around with. Click the image to zoom in and the icons to control. Full screen mode is pretty cool. Here’s a long exposure photograph of the spiral galaxy Messier 100. I collected the data for this picture over several nights in late February this year. 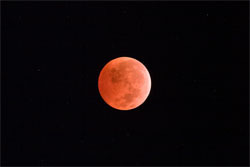 Exposure times were 2 hours each of Red, Green and Blue color channels and 2 hours 40 minutes of Luminance. Total exposure time: 8 hours and 40 minutes. Click the image above for a larger picture, or download this high res version of m100 3630×2420. Located roughly 55 million light years from Earth, Messier 100 is a grand design spiral galaxy estimated to be 160,000 light years wide. An amateur astronomer discovered a supernova in the galaxy Messier 95 on March 16th, 2012. Two weeks later, the supernova continues to shine bright. Here’s a picture of M95 I took earlier this week. 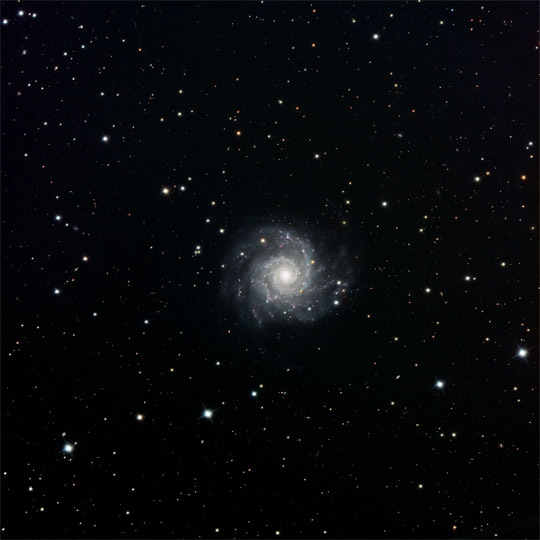 The supernova is the star to the lower right of the galaxy core. No one knows for sure when the supernova first erupted, but this object is not seen in pictures of the galaxy taken before March 20th. Messier 95 is an estimated 38 million light years away from Earth, which means the star in this galaxy would have exploded over 38 million years ago. A supernova is the most powerful release of energy in the Universe. This supernova from a far distant galaxy outshines some of the other stars in the picture, which are all in our local Milkyway Galaxy. This gives you a relative idea about how bright and powerful supernovas are. Last night was the first fully clear night we’ve had in weeks and with only a crescent moon popping out after 3:30, it was the perfect night for some astrophotography. I am still fine tuning aspects of my system and spent the first few hours of the night running tests, measuring various things and tweaking knobs in an effort to make improvements to polar alignment, PEC & collimation. I’ve gotten a new software suite from CCD Ware that really lets you fine tune these things. I didn’t want to waste the entire night tinkering so I moved on after making a little progress. Also on my list of procedural improvements, is mastering CCD Auto Pilot, which I’m getting better at, but still not entirely there. Last night I actually had a CCDAP5 session going great, but it lost the guide star after 2 frames and then lost the ability to plate solve. Not wanting to waste the night’s opportunity with tinkering, I rolled back to my non-automated procedures and started imaging the spiral galaxy Messier 106. 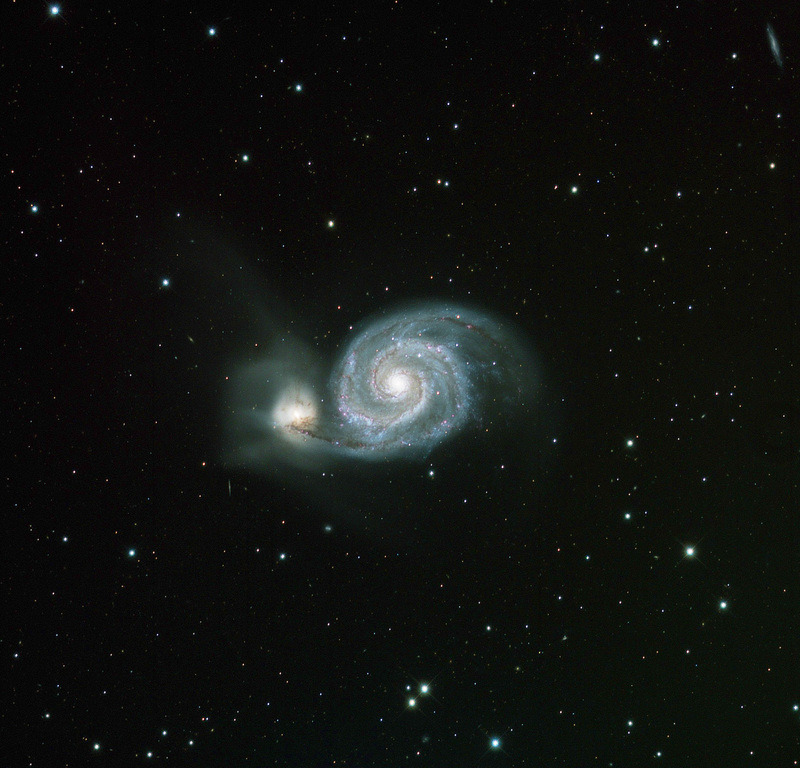 Here’s a photo I took from my observatory of Messier 51, the famous Whirlpool Galaxy. At an estimated 23 million light years away, M51 is one of the most famous galaxies in the sky and a popular target for amateur astronomers. M51 is an interacting, grand-design, spiral galaxy. Interacting means, the galaxy is merging with another galaxy resulting in a disturbance of both galaxies because the gravitational fields of each are ‘interacting’ with each other. Grand-design is a designation for a special type of spiral galaxy that has prominent, well defined continuous spiral arms. Less than 10% of all spiral galaxies are designated grand-design. 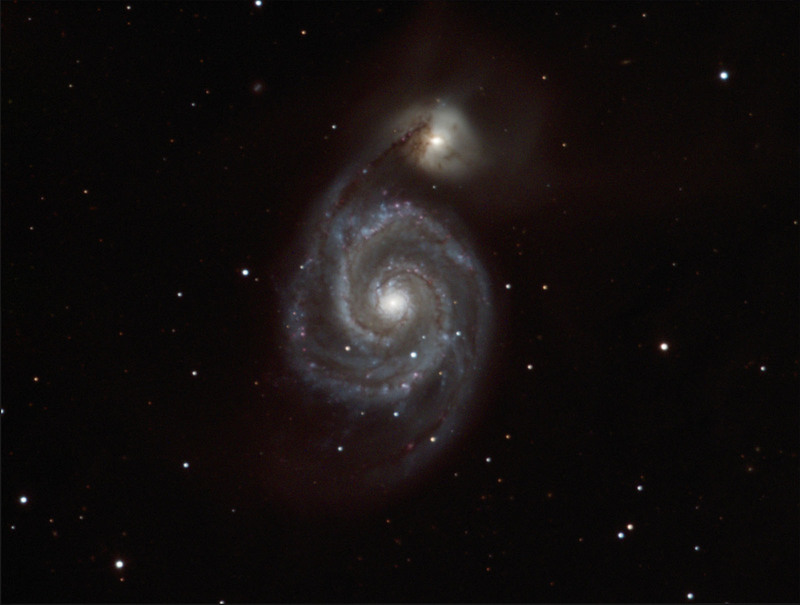 Earlier this year in June 2011, a super nova was discovered inside M51 bringing renewed attention to the galaxy. I don’t think the supernova is still visible in last night’s image. I did look to see if it was there though. 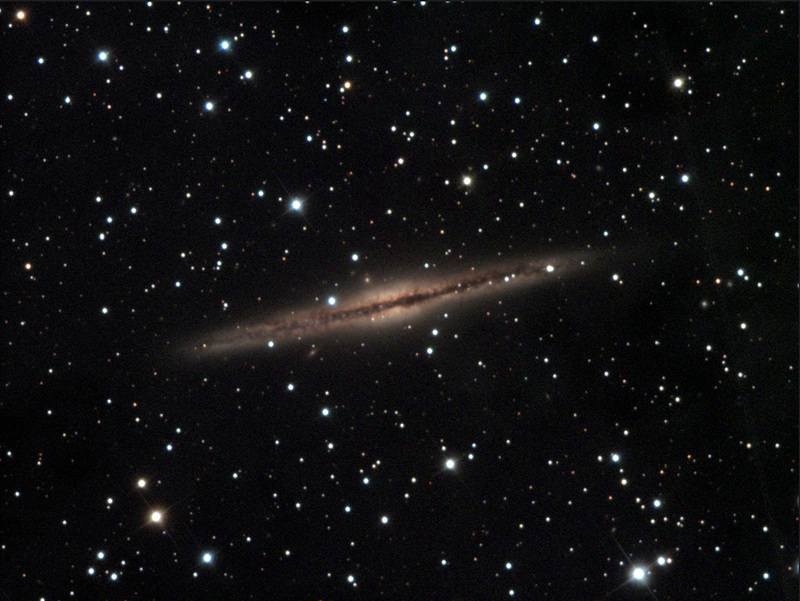 Here’s a photo of the Galaxy NGC 891. This is the first image I have taken with my new system where all things were working perfectly: mount, scope, focusing, temperature & software. I am especially excited about figuring out the automation software because I literally slept through this job! NGC 7331 is 49 million light years away and approximately 30,000 light years across. It was discovered by Wilhelm Herschel in 1784 and is one of the brightest galaxies not cataloged by Messier.